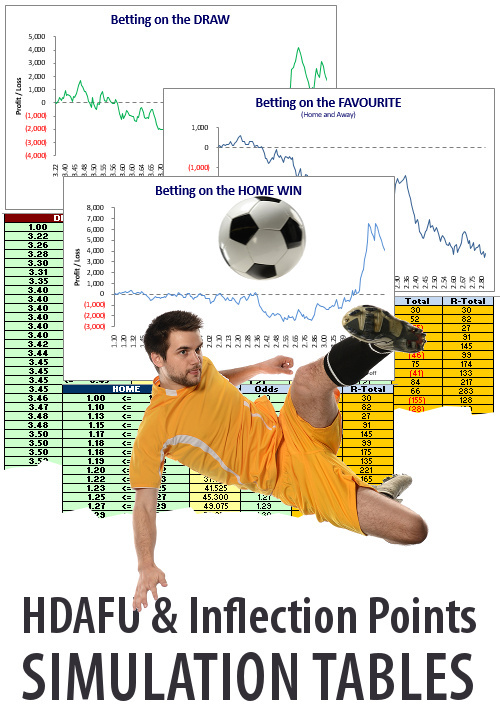 The Soccerwidow 1X2 HDAFU Tables provide a method of targeting the sweet spots in the 1X2 odds by identifying the inflection points for each bet type. In other words, the point in the odds where the largest profit zones begin and end. Armed with this information, you can begin betting more intelligently and within the areas that bring perennial profits. Don’t be an underdog – think like a favourite! And turn portfolio betting into an art form. Buy a range of 1X2 tables to compile a large portfolio of HDA bets and select the best systems from each league. 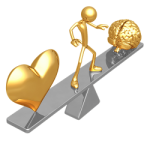 Balance your investment with a spread of: lower risk home-win or favourite-win systems; medium risk draw systems; higher risk away-win or underdog-win systems. And run your portfolio in the same manner pension firms, share traders and insurance companies manage their portfolios for profit. Each league is different, but by presenting the 1X2 profit results visually in the form of graphs, it is easy to identify which 1X2 betting type is the most profitable and, between which odds the most profitable zone lies. Betting methodically in this manner in a multitude of leagues provides the synergy that any large portfolio of investments relies upon to reach its intended profit goals. HDA betting has no mysteries once broken down into tabular and graph forms. Just use straightforward mathematics to pinpoint where the investments should be made. It’s as easy as 1X2! Soccerwidow HDAFU Tables make profiting from HDA (home-draw-away) results easier than ever before. Don’t be an underdog – think like a favourite! Turn portfolio betting into an art form. 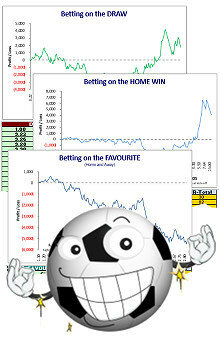 The Soccerwidow HDAFU Tables consider 1X2 betting not as a three-way bet type, but as a five-way opportunity including separate analyses of the favourite and underdog. Of course, the favourite could be playing at home or away, but in most cases it is the home team. This logic also applies to the underdog, but in most cases the underdog is the away team. Splitting the HDA results into favourites and underdogs produces a very revealing pattern. Profits and losses for the favourites can look markedly different from the home win results, whilst underdog profits and losses can differ greatly from the away win results. This level of attention to detail is what makes the 1X2 HDAFU Tables a unique and immensely powerful product. Try them and see for yourself – we are sure they will very quickly become your favourite betting assistant! make profiting from HDA (home-draw-away) results easier than ever before. the favourite, or the underdog in your leagues of choice. lies with a balance of over-priced underdogs and under-priced favourites. Visualisation of profit zones using the previous five seasons’ statistics and odds. The Inflection Point Graphs are the most effective method of identifying bets targeted in the sweet spots of the 1X2 odds ranges for any league. Diversify your portfolio in order to smooth out uncoordinated risks! The rationale behind diversification is the spreading of risk, which yields higher returns and poses a lower threat to bankroll than individual betting. Combine the profit zones from various leagues and compile a profitable portfolio. Balance your portfolio with a spread of systems: lower risk home or favourite wins; medium risk draws; higher risk away or underdog wins. Bet in all twelve months of the year with a range of Winter and Summer League tables. A whole-of-season analysis in each league is also broken into halves, before and after the natural mid-season or winter break split, to reveal astonishing differences. Packed full with comprehensive Excel formulas, handy for assisting with other external analyses or ideas. Each table comes with unique ‘odds toggle’ features and ‘betting exchange commission’ fields to help simulate the betting account of choice. Numbers and distribution of bets, yield targets and starting bank can all be established before the start of a campaign. Ultimately, your destiny is in your own hands without having to place blind faith in a third party picks service of unknown reputation or provenance. The HDAFU Tables are Excel spreadsheets that visualise the profit and loss zones within the odds ranges of the 1X2 bet types. Inflection Point graphs indicate where the largest profit zones have accumulated over five seasons, and once the data is filtered to focus on these zones for analysis, a summary table for this odds range shows how well each individual season has performed. If the performance is consistent across the board it is ripe for inclusion in a betting portfolio going into the following season. Sometimes there are several promising systems within a single league to decide upon. Inflection points are the points at which the curvature or concavity of a curve changes from plus to minus or, from minus to plus. Translated into layman’s language, this means the turning points on the profit/loss graph where the profit sector begins and where it ends. There are certain odds clusters (odds in-between the two turning points) where bookmakers constantly reduce their prices to ensure their own profits, and where they react to a high demand for bets (average 7% reduction of the prices – the bookmaker margin). To comply with the expectations of punters and the statistical probabilities within the event, bookmakers naturally have to increase their odds on one side of the equation to achieve a financial balance. As market pressure (supply) and punters’ demand (risk aversion and own interests) are different in each league (e.g. betting exchange liquidity varies greatly between leagues), naturally odds follow different market dynamics. The inflection point graphs reveal these dynamics in startling detail. Compile Your Own Betting System & Make It Work! For ideas about the potential of these tables and hard evidence of compiling successful portfolios take a look at the Summer League and Winter League campaign examples. There is nothing on the Net that gives away systems or even formulas behind successful betting systems but here at Soccerwidow we help you to build your own. Betting for Profit is Possible! Please be aware that risk is with us all, each day of our lives. Every time we cross the road, we are risking our safety. However, when it comes to financial risk (in this case, betting), people are definitely much more irrational by nature. Please take stock of your situation and how it affects those around you. …for methodical betting with the confidence that a profit will be made in the long run! 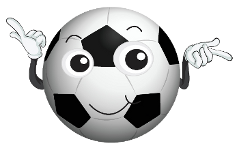 Soccerwidow HDAFU Tables – For developing a 1X2 betting system formulated by you and for your interests alone!